The achievement of savings in energy consumption is a national imperative in South Africa as energy consumers ask what they can do to reduce their energy bills. P3 range of thermal imagers for scanning the building envelope to build up a baseline picture of the energy lost through poor insulation via doors, windows, roofs, ceiling boards, light fittings, airconditioning ducts and pipes. 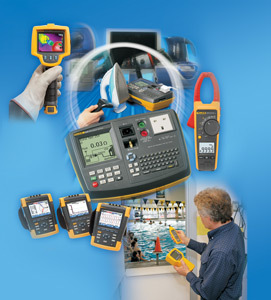 Fluke’s 6000 series portable appliance testers verify the electrical safety and operation of appliances like kettles, TVs, fridges, microwaves, coffee machines, hairdryers to address the final requirement of the section of the regulation that governs the safety of appliances used in buildings. In the spirit of compliance, Comtest has itself undertaken a comprehensive analysis of its head offices in Linbro Park, Gauteng, as to the energy usage and the energy wastage in its buildings. The findings of this audit will be soon be made available as a case history on Comtest’s website www.comtest.co.za and will comprise not only details of problems encountered but the monetary values of savings that could be achieved by fixing as many of the problems as is feasible. Examine design: Determine how your system can best support your processes and what infrastructure you need to prevent failure. Verify circuit capacity before installing new equipment. Re-check critical equipment after configuration changes. Comply with standards: For example, examine your grounding system for compliance with IEEE-142. Examine your power distribution system for compliance with IEEE-141. Examine power protection: This includes lightning protection, TVSS, and surge suppression. Are these properly specified and installed? Get baseline test data on all loads: This is the key to predictive maintenance, and it allows you to spot emerging problems. Question mitigation: Mitigating power quality problems includes correction (e.g. grounding repair) and coping (e.g. K-rated transformers). Consider power conditioning and backup power. Review maintenance practices: Are you testing, then following up with corrective actions? Conduct periodic surveys at critical points – for example, check neutral to ground voltage and ground current on feeders and critical branch circuits. Conduct infrared surveys of distribution equipment. Determine root causes of failures, so you know how to prevent recurrences. Use monitoring: Can you see voltage distortions before they overheat motors? Can you track transients? If you don’t have power monitoring installed, you probably won’t see a problem coming – but you will see the downtime it causes. At this point, you need to determine the costs of prevention and remediation – and then compare those to the costs of poor power quality. This comparison will allow you to justify the investment needed to fix the power quality problems. Because this should be an ongoing effort, use the right tools so you can do your own power quality testing and monitoring, rather than outsourcing it. Today, it’s surprisingly affordable – and it will always cost less than downtime.